Lovely 6x4 Spencer Idaho opal triplet gemstone set in silver filigree style ring. Dainty ring works well as a pinky ring, or a nice choice for youth. Made in Philipsburg, Montana. This simple sterling silver ring is set with stunning 10x8 Spencer Idaho opal triplet. Double prongs on top and bottom give this a contemporary feel. Larger stones are also available. Contact us for many more options! Made in Philipsburg, Montana. Beautiful Montana agate jewelry made from the agate from the Yellowstone River. No two pieces are identical. Very durable stone for years of wear. Done in sterling silver or 14k gold and looks great with Montana sapphire accent. Fantastic opal set in a dainty 14K gold setting. A simple yet elegant way to showcase the opal mined in Spencer, Idaho. Versatile enough for every day wear or evening wear. This beautiful piece includes the matching gold chain. Made in Philipsburg, Montana. 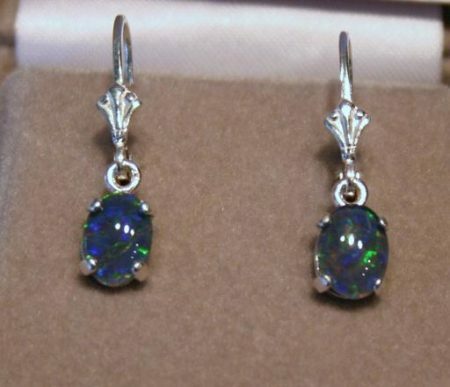 Showcase a genuine Spencer, Idaho opal in 14K gold! Perfect size to reveal the dazzling color and fire of the stone, yet remain dainty and feminine. This sparkling Idaho Opal pendant includes the matching 18" gold chain. Made in Philipsburg, Montana. Let us help you match your perfect stone and setting! This opal is sure to make the perfect gift! Set in 14K gold, this 10x8 Spencer, Idaho opal really shines. Pendant includes matching 14K 18" gold rope chain. Contact us to see the many different opal we have available. Made in Philipsburg, Montana.